Gophers, also called pocket gophers because of the pouches on their cheeks, build burrows and tunnels in their natural habitat. Unfortunately, they may turn your garden and lawn into their habitat. Underground tunnels can damage plants, impeding and interrupting root growth. Gophers may dig deeply into your outside areas, upsetting your plans and all your careful gardening. Gophers are disruptive diggers that may damage your garden. Gophers are between 6 and 10 inches long, though they are rarely seen outside their underground system of tunnels and burrows. Don't look for the gophers. Focus instead on the evidence of their presence in your yard. Gophers pile up small soil mounds while they carve new tunnels under the ground, so a fresh hill of soil is a good sign that you have a gopher present. From above, mounds are made in a slightly crescent or arc shape. Gophers are voracious diggers, and even one may wreak havoc in your yard. Gophers don't just dig up soil, disturbing plants from under the ground. Gophers also eat garden crops, ornamental plants, trees and shrubs. Just one gopher may create considerable damage, as they will also chew on water lines and sprinkler systems. Gophers will eat anything palatable and accessible out of the garden, and their underground system of life gives them lots of ways to find your precious plants. A single gopher may build several mounds in the space of one day. Gophers dig most frequently in spring and fall, when soil is easiest to work, but digging activity never stops completely. Even in winter, gophers will dig and tunnel in the snow. The entire tunnel/burrow system may be anywhere from 200 to 2,000 square feet large, each burrow 2 1/2 to 3 1/2 inches wide. Usually, feeding burrows are built 6 to 12 inches below the surface of the soil. Deeper chambers, as deep as 6 feet, are built for the nest and storage chambers. 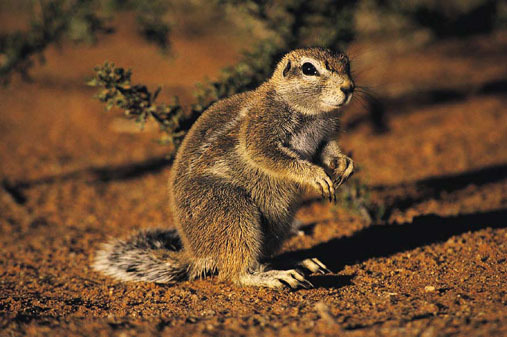 Gophers are capable of pulling entire plants into their burrows by grabbing onto the underground roots. Before using management techniques to get rid of gophers, check with your region's game and wildlife commission. Chances are, gophers will be considered huntable at any time of the year, but it's always best to check local laws first. Traps and fumigation techniques are effective in gopher management. It's also possible to locate and plug gopher holes with dirt and gravel to drive them out.